Newcastle's latest cheeky Super Bowl effort calls on brands of all sizes to come together to split the cost of making a commercial. A number of large companies have decided to sit out advertising during this year’s Super Bowl, giving smaller brands and marketers with 360-degree campaigns a chance to shine during the big game on Sunday. M&M’s, H&M, Dannon, and a number of major automakers, such as Volkswagen, General Motors, Ford, and Lincoln are among those that have decided not to run ads at the NFL’s marquee event on Sunday. Yet even with the exorbitant price to run an ad, viewers don’t have to worry about a Super Bowl commercial drought, since many brands are joining the marketing madness for the first time or returning to the game after years away. "In the last few years, we’ve seen that some of the lesser-known brands have had the most impact because they’re not known yet, so you have this huge platform to get your name out there," explains Jeri Smith, CEO of advertising research firm Communicus. Smith cites GoDaddy as a prime example of a small company that achieved significant results after spending a lot of money to advertise during the Super Bowl in 2011. Just 15 minutes after airing its first commercial, the company reportedly saw domain name registrations increase by more than 466% compared with the same time of the previous year. Some companies jumping into the fold this year include Loctite’s Super Glue, mobile battery pack brand Mophie, Carnival, and Avocados from Mexico. Financially, it makes sense for a lesser-known company to showcase a Super Bowl ad when millions of people are watching, rather than spending the same amount on a campaign that may not reach as many customers, says Smith. While numerous carmakers are taking a break from Super Bowl advertising this year, Nissan is returning to the Super Bowl after nearly 20 years, while Victoria’s Secret will air its first ad during the event in seven years. And many of the usual suspects, such as Anheuser-Busch, Doritos, and Snickers, will air spots during the game. "It’s typically harder for the larger brands to have an impact simply because they’re not going to build awareness – everyone is already aware of them – and they’re not going to change attitudes or behavior with a single Super Bowl exposure," notes Smith. One way large brands can successfully break through the clutter, she adds, is by debuting products, such as auto companies revealing cars during the Super Bowl. Angie Kozleski, global marketing and digital communications manager at Ford, says that while the Super Bowl is a great venue for the company to reach fans, "this year’s event doesn’t align with our plans." The company lifted the veil on its 2015 Ford F150 during the NCAA College Football Playoff this month, leaving the automaker without a vehicle to reveal during the Super Bowl. Kozleski says the brand is "always listening and watching" for ways to creatively engage consumers on social media, but at this time, it doesn’t have any specific plans to act on the Super Bowl. General Motors also has no models to launch this Sunday, but with GMC as the official vehicle of the NFL, the company will remain active in its marketing and communications throughout the game. Representatives from GM declined to give specifics, but the automaker reportedly sent more than 600 vehicles to Phoenix to provide transportation for celebrities, executives, and other VIPs. 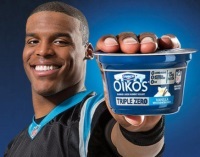 Dannon, the official yogurt sponsor of the NFL, introduced Oikos Triple Zero Greek at the beginning of this month. Even though it has a new product to promote, it decided not to advertise during the Super Bowl this year, says Michael Neuwirth, senior director of PR at the company. "We looked at the best media opportunity, and it was clear to us that while we’re big fans of the Super Bowl, it was not the best way for us to build the reach and awareness through our advertising for this product," he explains. He adds that yogurt is "a food not typically associated with the Super Bowl." Yet this doesn’t mean Dannon won’t try to leverage digital and social media during the game if an appropriate opportunity arises, says Neuwirth, but its focus will be more on brand-building than promoting consumption. Another food brand that will be on the bench this Sunday is Mars Chocolate’s M&M’s. Even though the colorful chocolate candies won’t be seen in an ad, the brand "will find creative ways to engage consumers around the game through social media content and real-time marketing," according to a company spokesperson. Last year, M&M’s teamed up with former San Francisco 49ers quarterback and three-time Super Bowl MVP Joe Montana to provide real-time content on social media throughout the game alongside the brand’s yellow candy "spokesperson." Connecting with fans on social media is a great way for brands that are not advertising to get attention, but Smith warns that if the real-time efforts are not relevant, they can look forced and out of place. Heineken’s Newcastle, Smith says, is a great example of a brand that has been able to capture consumer attention during the game without spending a ton of money on ads. In 2014, the beer brand launched its If We Made It campaign about the Super Bowl spot it could have made – but didn't – as a way to poke fun at over-the-top marketing. The initiative won 13 awards last summer at Cannes. This year, the beer brand is back at it, having cheekily launched a video that spoofs Doritos’ Crash the Super Bowl fan-generated ad contest as a way to get into the game. Earlier this week, Newcastle also showcased its latest effort, which called on brands of all sizes to come together to split the cost of making a commercial. Thirty-seven brands, including Newcastle, made the final cut of the video, but more than 350 companies stepped forward, says Priscilla Dohnert, brand director for Newcastle and Amstel at Heineken. 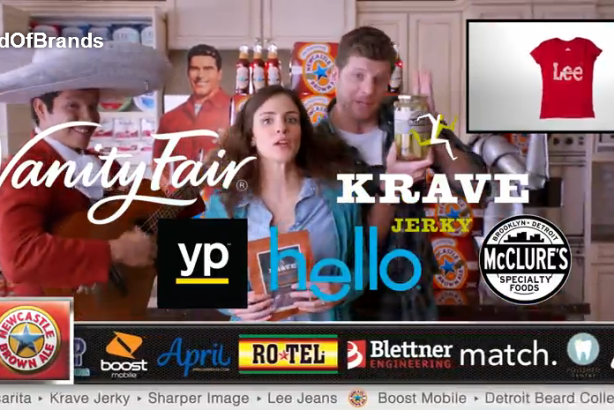 Among the companies featured are Brawny Paper Towels, Beanitos Chips, Quilted Northern, Jockey, Match.com, Hunt’s Tomatoes, and Boost Mobile. "As a smaller brand without the resources of some of our bigger competitors or big-game advertisers, we have to be resourceful," says Dohnert. "We’ve seen great results from being scrappy, and with using digital and creating great content that people will want to share and talk about on their own." Newcastle saw double-digit increases in awareness and trial in markets with in-store displays, as well as sales spikes in distribution, from the 2014 campaign, so Dohnert says the goal of being the "most talked about brand around the big game" remains the same this year. Of course, many brands that have decided to run an ad during the game aren’t putting all their eggs into one basket. Smith believes the most successful companies will be those that supplement their commercials with social elements, PR, and consumer involvement. Unilever’s Dove Men+Care will show a commercial on Sunday as part of its Real Strength campaign. Its goal: "celebrate the real side of male strength, so men and women can see what masculinity really means and looks like reflected back to them," says Jen Bremner, US marketing director for the brand. The impetus for the initiative was the brand’s Care Makes A Man Stronger study, which showed that men find relatable, caring moments that define masculinity to be absent from the media landscape today. On social, fans will be asked to show the caring side of men in their lives by sharing photos using the hashtag #RealStrength, which is also featured in the commercial. Select photos will be showcased on the brand’s digital channels, and the brand will launch a live photo gallery on its website that will pull content from social conversations. Dove Men+Care is using an all-inclusive campaign approach because it "allows us to have more meaningful conversations with the large and engaged audience who tune into the game," Bremner says.